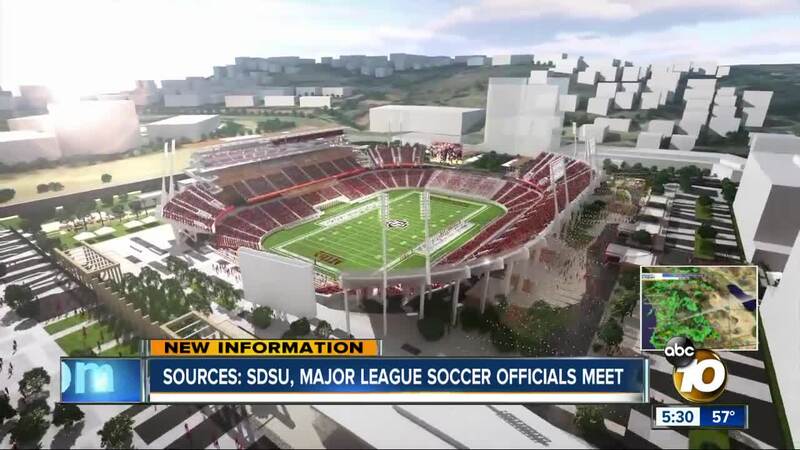 Officials from Major League Soccer and San Diego State University have met to discuss the possibility of a team playing in the new Aztec football stadium once it opens in 2022. In November, San Diego voters approved the SDSU West initiative. It cleared the way for the city to sell the SDCCU (formerly Qualcomm) stadium site to SDSU for a Mission Valley campus. That includes housing, hotels, a river park, and a 35,000 seat stadium. Voters also rejected the competing SoccerCity Intiative, which would have brought Major League Soccer to San Diego. Nick Stone, the project manager, said during the campaign that SoccerCity had exclusive negotiating rights with the MLS. Reached Monday, Stone declined to comment. McGrory said SDSU has also met with the San Diego Fleet, a new Alliance of American Football team that will call SDCCU Stadium home.